By Colton Heffington for Denver Dialogues. 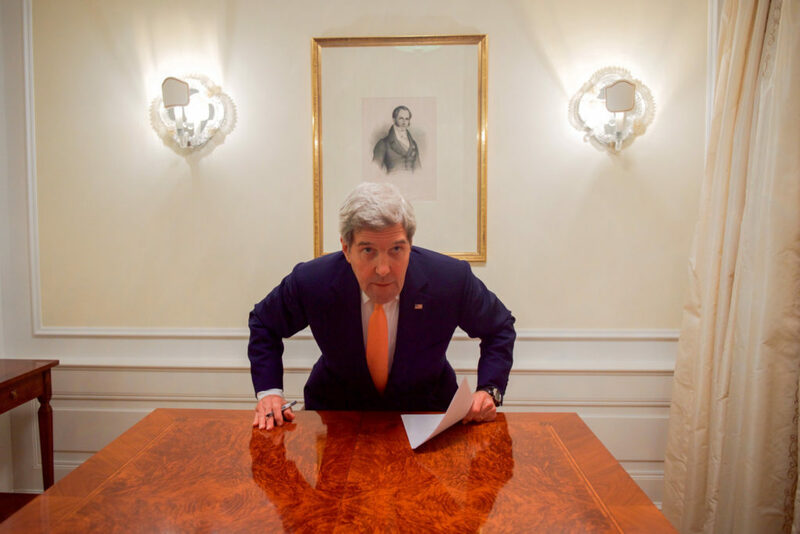 Former Secretary of State John Kerry rises from a desk in Vienna, Austria, after signing documents to lift sanctions against Iran, January 16, 2016. Photo via U.S. Department of State. Economic sanctions have wide-ranging consequences for both political leaders and ordinary citizens in targeted states. Sanctions can be particularly disastrous for citizens in so-called target states, creating an environment of serious economic instability. In a recent publication at the Journal of Global Security Studies, I argue that the instability caused by sanctions can create a hospitable environment for terrorist groups and subsequently lead to increasing levels of domestic terrorism in target states. First, destabilizing sanctions allow terrorist groups to recruit and carry out attacks by generating new grievances amongst ordinary citizens who would not otherwise support violent groups, either implicitly or explicitly. The sharp economic costs associated with sanctions give terrorist groups recruiting leverage. For example, the Iranian group Mojahedin-e-Khalq’s (MEK) Marxist appeals had limited recruiting success, but complaints about economic conditions in Iran tapped into a broader set of grievances. MEK used economic damage caused by US-imposed sanctions as part of their propaganda campaign against the Iranian government following the 1979 revolution. But sanctions do not merely provide propaganda fodder for violent groups; they broaden the pool of available recruits by imposing hardship on citizens and restricting economic opportunity. Sanctions generate relative deprivation and economic-based grievances within the civilian population that terrorist groups are well-positioned to exploit. The economically disenfranchised make ideal recruitment candidates for terrorist groups, and sanctions vastly increase economic strain amongst potential recruits. Moreover, the individuals dislocated by sanctions are often well-trained, highly skilled workers; as a result, sanctions not only increase the total number of potential recruits for terrorist groups, they also increase their overall quality. By gifting terrorist groups an effective recruiting message and strengthening their pool of recruiting talent, sanctions actually increase levels of terrorism. I examine whether sanctions increase domestic terrorism in target countries using data from the Global Terrorism Database and the Threat and Imposition of Sanctions Data. I find that sanctions are associated with increasing domestic terrorism even when accounting for numerous other factors (civil war, government repression, etc.). Harsh sanctions increase domestic terrorism in the average target state by about four attacks in the year they are imposed. 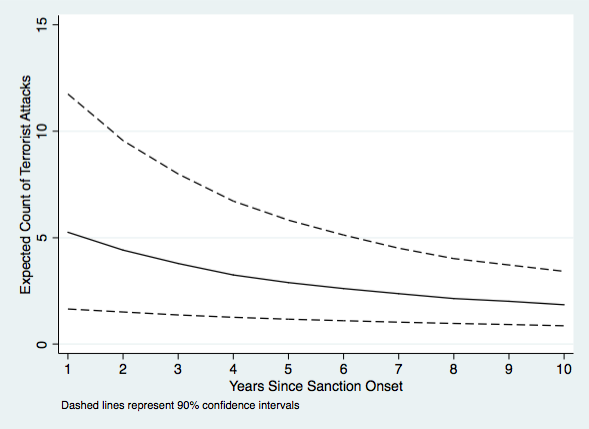 I also find that sanctions sharply increase terrorism in the short-term, but that this effect decays steadily over time. Terrorism and Sanctions over Time. These findings provide insights into one of the enduring puzzles relating to terrorism: how does the economy affect terrorism? For instance, we know that terrorism is more likely in states with low levels of aggregate wealth, but that many terrorists are educated and financially well-off. My research expands our understanding of the link between the economy and terrorism by demonstrating the conditions under which skilled individuals are likely to develop feelings of relative deprivation and embrace political violence. This work further suggests that interested policymakers and researchers should focus less on absolute poverty and more on shocks to the economic status quo. Understanding the unintended consequences presented by sanctions is crucially important for the US government and its allies, the most common implementers of comprehensive sanctions by far. Though sanctions are intended to undermine terrorist groups, they may undercut these efforts by creating fertile recruiting ground for domestic terrorist groups linked to the transnational groups targeted by the US. At the end of the day, sanctions may undermine the government in target states at the expense of generating collateral damage that runs counter to the United States’ broader foreign policy goals. Colton Heffington is a Graduate Instructor in the Department of Political Science at the University of Missouri. Loved this article as I love all articles on this site. One could probably associate this article with the creation of fragile cities (see Robert Muggah). Sanctions create social issues such as unemployment, scarcity of product, etc. 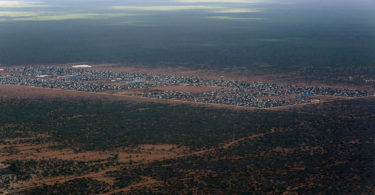 This creates unrest in the population…end result: fragile cities.